7.2.1 Distance between two points: We have learnt how to plot points on a plane in a graph sheet. There are many instances where we need to find the distance between two points (length of the line segment joining two points). We know that any point can be represented in terms of co-ordinates of x and y. Let P (x1,y1) and Q (x2,y2) be the two points. We are required to find the length of the line PQ. Draw PA and QB perpendicular to x axis from P and Q respectively. Draw PC and QD horizontal to Y axis from P and Q respectively. Produce CP to meet BQ at R.
Corollary: What if one point is the origin (0,0) ? The point P(0,2) is equidistant from Q(3,1) and R(1,5). By solving the above two equations we get x=3 and y=3. Hence O(3,3) is the Circumcenter of ABC. This section is about finding a point on a line such that the point divides the line in the given ratio. Let AB be the line joining the point A (x1, y1) and B(x2, y2). We are required to find a point P(x, y) on the line AB such that it divides AB in the given ratio of m1:m2. From A, P and B draw perpendiculars to the x-axis and let these perpendiculars meet x- axis at C,Q and D respectively. From A and P draw parallel lines to x axis to meet PQ at E and BD at R.
This is known as ‘section formula’. 1. What are the co-ordinates of midpoint of AB (i.e. when m1:m2 = 1:1)? Note: The above formula can be used to show that the quadrilateral formed by joining the midpoints of adjacent sides of a quadrilateral is a parallelogram. 2. What are the co-ordinates of the point which divides the line in the ratio of k:1? 1. Find the co-ordinates of P(x1,y1) such that AP:PB = 1:2. 7.2 Problem 7: In triangle ABC, D(-2,5) is mid point of AB, E(2,4) is mid point of BC and F(-1,2) is mid point of AC. Find the co-ordinates of A,B and C.
Given the three vertices of a triangle let us calculate the co-ordinates of the centroid. AD is one median and G is the centroid which divides AD in the ratio 2:1. We are required to find the co-ordinates of G.
7.2 Problem 8: Find the third vertex of a triangle if two of its vertices are at A(-3,1) and B(0,-2) and the centroid is at the origin. Thus (3,1) is the third vertex. As in the adjoining figure let A (x1, y1), B(x2, y2) and C(x3, y3) be the three vertices of a triangle. 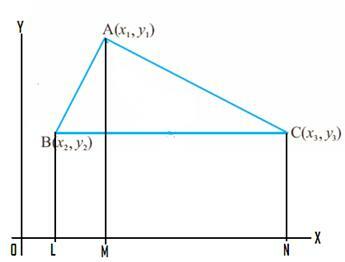 We are required to find the area of triangle ABC. Let BL, AM and CN be perpendiculars from the vertices B, A and C to x-axis. Note that if A B and C are collinear then area is zero. 7.2 Problem 8: If D(3,-1), E(2,6), F(-5,7) are the mid points of the sides of ABC, find the area of ABC.